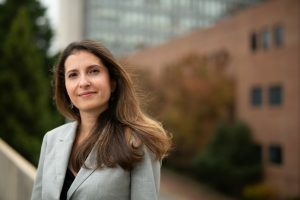 The National Cancer Institute has awarded a five-year grant of more than $2.2 million to UNC Lineberger’s Yuliya Pylayeva-Gupta, PhD, to support her research into the immune response in pancreatic cancer, one of the deadliest cancers. Pancreatic cancer has proven to be extremely difficult to treat, with just 9.3 percent of patients living five years following diagnosis. Immune-based treatments known as checkpoint inhibitors have been effective in treating some cancers. While scientists have discovered there are immune cells often within pancreatic cancer tumors, responses to immune-based treatments have been ineffective in pancreatic ductal adenocarcinoma. Previously, Pylayeva-Gupta’s laboratory discovered that interleukin-35 plays a role in suppressing cancer-fighting immune cells in pancreatic cancer. This molecule – called a cytokine – is produced by B-cells, a type of immune cells that is responsible for creating disease-fighting antibodies that can remember infections when they return. The researchers will use the grant to investigate the mechanism behind the effect of IL-35 on the immune system in pancreatic cancer, and to identify treatment targets at which to direct a combination of current and novel immunotherapies.